BareFeats、12.9インチと9.7インチiPad Proを用いた「Lightning - USB 3カメラアダプタ」のインポートベンチマークを公開。 | AAPL Ch. As you can see from the graphs above, 12.9-inch iPad Pro using the Lightning to USB 3 Camera Adapter sampled and created thumbnails of the 13 NEF images 604% faster than the 9.7-inch iPad Pro. And it converted and imported the images 164% faster. iPad Pros – Photo Import Speed? The Lightning to SD Card Camera Reader is more convenient if not the fastest. 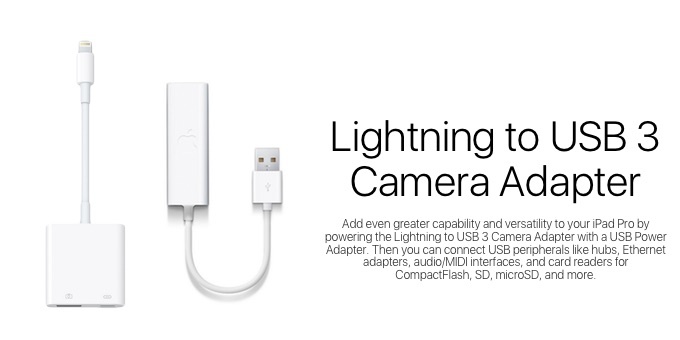 The Lightning to USB 3 Camera Adapter is faster and more versatile since it can be used with any compatible USB device whether it requires external power or not. And both are fastest when used with the 12.9-inch Mac Pro.